The Palace was built and opened in 1925 at the peak of the heyday for American movie palaces. It was originally part of a small family of theaters owned and operated by Adam C. Baker, a dashing Hawaiian gentleman who was the nephew of the last royal governors of the island of Hawai‘i. Adam Baker had been involved in the theater business since the early 1900s and was a well-known showman in Hawaii. The Palace was built on a scale that had never been seen outside of the capital city of Honolulu, and it was always the grandest theater on all the neighbor islands. One unusual feature was that the Palace’s structure was entirely of redwood, imported from the Pacific Northwest. Fourteen huge redwood columns supported the wooden roof trusses which span the entire width of the building. The roof, sides and back were sheathed in corrugated sheet metal, a very typical construction style in tropical Hawaii. The building’s façade is an elegant neo-classical design executed in stucco with wood molding accents. The Palace was designed to take maximum advantage of its limited property size. 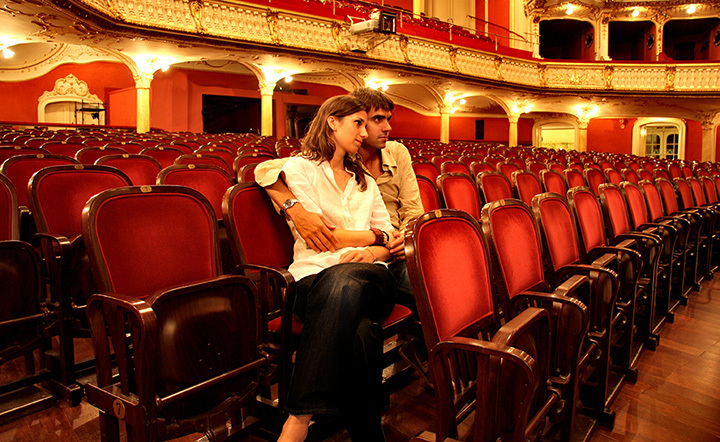 The stadium seating arrangement (pre-dating the "discovery" of stadium seating by modern theater operators in the 1990s) allowed for unobstructed sight lines, while giving the Palace a very spacious lobby. Popular organist Johnny De Mello (seen at left in 1933) performed at the Palace for about ten years beginning in 1932. He had previously been featured at the Kaimuki Theatre, in Honolulu. During his time at the Palace he hosted the Mickey Mouse Club, staged many shows and musical revues, and had a weekly live radio show over KHBC from the Palace. In the 1940s Johnny returned to Honolulu. In 1955 he was appointed house organist at the Waikiki Theatre and played there until his retirement in 1978.